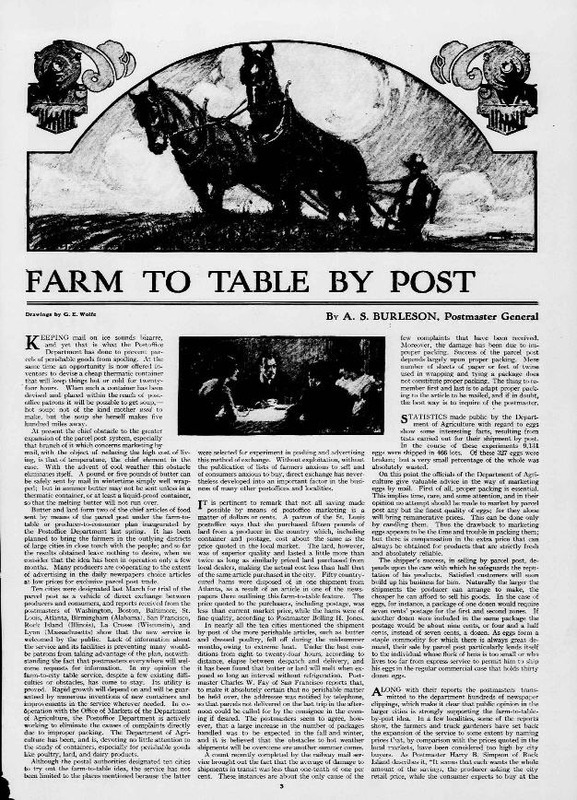 [The] farm-to-table movement was an ambitious postal initiative that took place during President Woodrow Wilson's administration, seeking to transport produce directly from rural areas to cities. The program entailed picking up farm-fresh products—butter, eggs, poultry, vegetables, to name a few—and taking them as directly and quickly as possible to urban destinations. It was conceived and launched in peacetime, but took on additional significance during America's eighteen-month involvement during what we know today as World War I. In the course of that bloody conflict, the experimental motor truck routes set up as part of that program were seen by many as important to the nation-wide food conservation campaign. "Opportunity is now offered all farmers and other producers to engage in the mail order business by disposing of their products through the medium of the parcel post. Never before has a greater opportunity been offered to producers to build up a profitable business. The Post Office Department agrees to advertise the producers [sic] business and name, and the products they have for sale, without cost. Experiments conducted so far indicate that the 'Farm-to-Table' plan is a comparable success and capable of being developed to much larger proportions. Thousands of consumers in Chicago are now receiving weekly shipments of farm products. Many more are willing to co-operate. If you have farm products to ship by parcel post to city consumers, or if your name already appears on the Produce List and you desire to list new products, secure one of the blanks from Postmaster Potter, fill it out and return same to him. Your name will be then be published in the list now being compiled. There is a big demand in Chicago for home-cured hams and bacons, smoked and fresh meats, poultry, eggs, butter, cheese, nuts, maple syrup, honey, jellies, preserves, fruits, vegetables, and other farm products at reasonable prices. Do not expect prices asked by city grocers. Divide your profits with the consumers, and offer inducements to your customers in order to retain them. Information regarding containers, rates, and other matter concerning the 'Farm to Table' plan may be had by consulting your rural carrier or Postmaster Potter." The story above describes the program as a way for producers to make money by selling those farm goods that would otherwise go to waste. Consumers would be entered in an on-going relationship similar to today's "Community Supported Agriculture" initiatives whereby they receive regular shipments of fresh food from a single farmer. 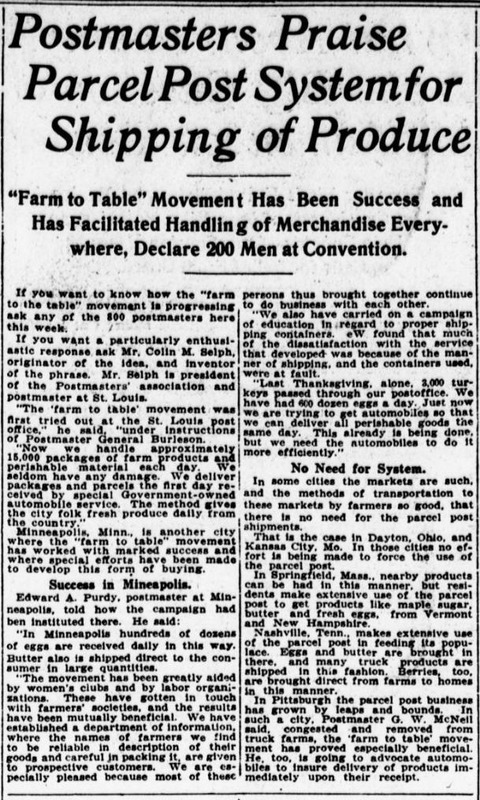 "Growth of the farm-to-table service by parcel post is recorded in reports from the postmasters of the principals [sic] cities in which the service has been installed. The results are said to be gratifying in the large centers of population where the need for additional facilities of obtaining fresh country produce is greatest. In practically all the large cities and in industrial communities the service is now firmly established. The postal authorities are pleased to find that the opposition of city and country retailers to this and other features of the recent development of the parcel post has died out. The merchants, they assert, are finding that the governments express facilities are of value to them. 'Parcel-post selling, it is declared, is no longer confined to the big mail-order houses. Green grocers and even butchers in country towns, and in some cases the farmers themselves, through the organization of co-operative selling agencies, are collecting the farm produce of their locality and marketing it in the cities by mail order. This practice is encouraged by the post office department. Country selling agencies, it has developed, whether co-operative or privately managed, articulate the output of many farms, standardize price and quality and assure a steady supply and a reliable system of exchange. In nearly all the cities where lists of farmers have been circulated merely names and an enumeration of articles offered for sale have been included. In several of the cities, however, prices were added. In these instances it was found that the producers quoted widely varying figures. 'The parcel post has done much and promises to do much more toward completing a system of food distribution which will knit the city and country more closely together,' said an official of the post-office department. 'With its rural free delivery service the postal establishment reaches virtually all farming territory, and alike expands the selling opportunity of the producer and buying opportunity of the consumer. Farmers hitherto unable to reach the city market have had little cash demand for their barnyard, truck and dairy products , and have been compelled to dispose of them in trade at the nearest country town. " If you want to know how the 'farm to the table' movement is progressing ask any of the 800 postmasters here this week. If you want a particularly enthusiastic response ask Mr. Colin M. Selph, originator of the idea, and inventor of the phrase. Mr. Selph is president of the Postmasters' association and postmaster at St. Louis. Butter and lard form two of the chief articles of food sent by means of the parcel post under the farm-to-table or producer-to-consumer plan inaugurated by the Postoffice Department last spring. It has been planned to bring the farmers in the outlying districts of large cities in close touch with the people; and so far the results obtained leave nothing to desire, when we consider that the idea has been in operation only a few months. Many producers are cooperating to the extent of advertising in the daily newspapers choice articles at low prices for exclusive parcel post trade. 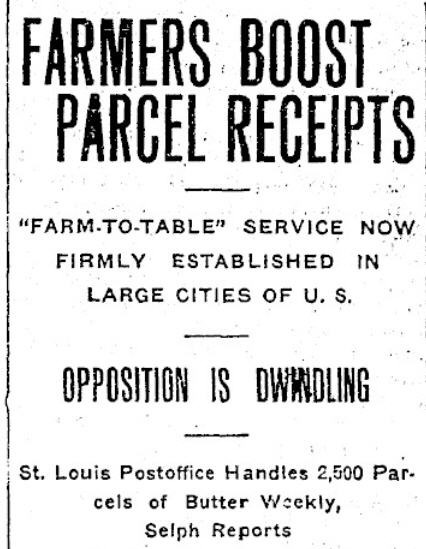 Ten cities were designated last March for trial of the parcel post as a vehicle of direct exchange between producers and consumers, and reports received from the postmasters of Washington, Boston, Baltimore, St. Louis, Atlanta, Birmingham (Alabama), San Francisco, Rock Island (Illinois), La Crosse (Wisconsin), and Lynn (Massachusetts) show that the new service is welcomed by the public. Lack of information about the service and its facilities is preventing many would be patrons from taking advantage of the plan, notwithstanding the fact that postmasters everywhere will welcome requests for information. In my opinion the farm-to-city table service, despite a few existing difficulties or obstacles, has come to stay. Its utility is proved. Rapid growth will depend on and will be guaranteed by numerous inventions of new containers and improvements in the service wherever needed. In cooperation with the Office of Markets of the Department of Agriculture, the Postoffice Department is actively working to eliminate the causes of complaints directly due to improper packing. The Department of Agriculture has been, and is, devoting no little attention to the study of containers, especially for perishable goods like poultry, lard, and dairy products.